WHAT: Community Gathering with Speak-Out, Community Resources for Low-Income People, Food, Children’s Activities. Practical experiences of and campaigning against poverty, war, criminalization of survival, solitary confinement, prison/jail expansion, deportation, removal of children from their moms due to poverty, lack of resources that tear families apart, and the destruction of the planet. For a world that Invests in Caring for People and the Planet, Not Killing. Information will be available on getting criminal records expunged; access to welfare, SNAP/food stamps, medical care, assistance with immigration questions; dealing with DCFS. The event is collaborating with the weekly food distribution by RAC-LA. 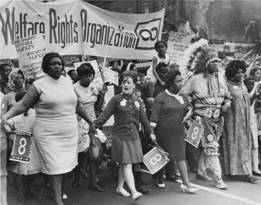 Passage and implementation of the Social Security caregivers Credit Act (H.R. 5024, Rep Nita Lowey D-NY), another step toward recognizing caregiving as work. Child welfare agencies stop removing children from families because of poverty, racism, sexism or other bias rather than abuse or neglect. A living wage for mothers and other caregivers – we are launching an international petition. Resources for the care of people and the planet, not war and occupation. 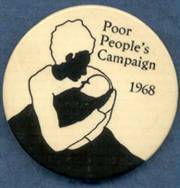 To commemorate Martin Luther King Jr’s 1968 Poor People’s Campaign (PPC), grassroots groups are taking actions in Washington DC and several US cities, Ireland and England the week of July 14 to Stop the War on the Poor. This is the first of what organizers plan as an annual action. They aim to expose – and change – that while one in two people in the US lives at or near poverty and the planet is on the brink, the US spends $682 billion on the military, nearly half the world’s total. Women and children are the majority of the poor. Women do 2/3 of the worlds work for 5% of the Income (ILO), yet the fundamental work of mothers and other primary caregivers is unvalued and unsupported. In addition to a pots and pans rally outside the White House, campaigners will be meeting with religious organizations and members of Congress. Demands include: passage and implementation of the RISE Out of Poverty Act (H.R. 814, Rep Gwen Moore, D-WI) that makes the elimination of child poverty central to welfare legislation; passage of the Social Security Caregiver Credit Act (H.R. 5024, Rep Nita Lowey, D-NY), another step in the direction of valuing caregiving; child welfare agencies to stop removing children from families because of poverty, racism, sexism; and a living wage for mothers and other caregivers. “They cut my food stamps from $80 to $15 last month. Now I have to pay all my bills and buy food with just $300 left after paying rent. It is almost impossible to make it now. What can I do?” E.P., an elder with a disability. “I am raising two kids on my own and only got $23 last month after welfare cut off my childcare so I couldn’t do the welfare work. Now I’m facing eviction and just don’t know what to do. They say I can’t get any more help because I met my time limits this month.” C.S, a young mom. Southern California Planning Group: Alexandria House; California Families to Abolish Solitary Confinement; DCFS Give Us Back Our Children; Every Mother is a Working Mother Network; Food Not Bombs; F*WORD, Santa Cruz; (Homeless Bill of Rights Campaign – for ID purposes), Western Regional Advocacy Project (WRAP); KidVillage@OccupyLA; LA No More Jails; Long Beach Area Peace Network; Martin Luther King Coalition of Greater LA; Military Families Speak Out-OC; OccupyLongBeach; RAC-LA; Sin Barras, Santa Cruz; Women of Color/Global Women’s Strike & GWS/LA; Veterans for Peace Los Angeles. That this House welcomes the Stop the War on the Poor initiative which commemorates Martin Luther King’s Poor People’s Campaign launched just before his assassination on 4 April 1968; further welcomes the RISE Out of Poverty Act now before the US Congress, which would make the elimination of child poverty the priority of welfare policy and recognises the caring work of mothers and other carers; believes that the UK would benefit from a similar policy since four million UK children, one in three, are living in poverty; notes that Dr King condemned the Vietnam War, accusing Congress of hostility to the poor by spending military funds with alacrity and generosity; further notes that he supported mothers’ right to welfare, a living wage and a guaranteed income for all; rejects US-style workfare as it forces unwaged carers to work for their benefits, undermining both the minimum wage and pay equity; and reaffirms humanity’s assumption that every child is precious to the whole society, and that every primary carer is entitled to resources and support for their life-saving, life-enhancing caring work. Fact Sheet – Stop the War on the Poor! Pennsylvania Ave between 15th and 17th Sts. Take action in your city, town or rural area. 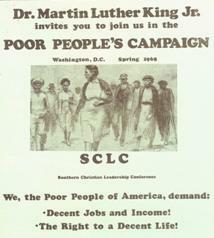 Stop the War on the Poor commemorates Martin Luther King Jr’s Poor People’s Campaign (PPC). In 1968, just prior to his assassination, Martin Luther King Jr condemned the Vietnam War and called for the PPC culminating in a Poor People’s March in DC in June, demanding a living wage and a guaranteed income. He said Congress had shown “hostility to the poor” by spending “military funds with alacrity and generosity”. Coretta Scott King spoke out against poverty and in support of welfare mothers. Prison family members (particularly mothers, daughters, partners, wives), formerly incarcerated persons, opponents of solitary confinement and mass incarceration and others in Pennsylvania will be fasting and making calls to Governor Corbett and DOC Secretary Wetzel on July 8 to join the California Families Against Solitary Confinement and supporters around the country and the world in commemorating the one-year anniversary of the CA prison hunger strike. On July 8, 2013, 30,000 prisoners across California began their 3rd hunger strike — the largest in UShistory and the largest and longest in California prison history — to improve their own conditions and as an “act of solidarity with oppressed people around the world”. As a result, they have won: close to 500 prisoners now a step closer to being released, and over 100 released from solitary; contact visits with loved ones and more, but solitary confinement continues. They have issued a three point action plan (see below). More info: CA Families Against Solitary Confinement (CFASC) www.abolishsolitary.com, (714) 290-9077. 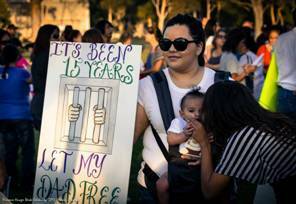 Join California Families Against Solitary Confinement (CFASC) to commemorate the LARGEST HUNGER STRIKE IN HISTORY! On July 8, 2013, 30,000 prisoners across the state began their 3rd hunger strike — the largest in US history and the largest and longest in California prison history — to improve their own conditions and as an “act of solidarity with oppressed people around the world”. As a result, they have won: close to 500 prisoners now a step closer to being released, and over 100 released from solitary; contact visits with loved ones and more, but solitary confinement continues. They have issued a three point action plan (see below) and need our continued support. Fast for all or part of July 8th in support of the hunger strikers!